Welcome to the Modular Office Requirement Form. Here you can use this tool to design your Modular Office and we will take the information and get right back to you with a quotation. Try to imagine your ideal layout – think of how you will utilize your space for desks, chairs cubicle partitions. The options below will help you bring this design to life. 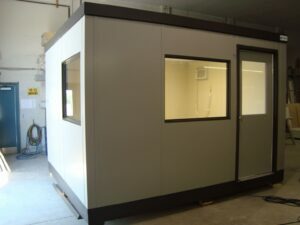 We can provide you with a Pre-Assembled Office or we can supply the Materials to Assemble Onsite. Our team of professional installers are available to assemble in a quick, clean and safe manner. If you have any questions contact us directly and we will assist you right away. It is also recommended to e-mail a drawing or sketch of your suggested office layout to info@thematerialhandler.com and include your company name in the subject line.